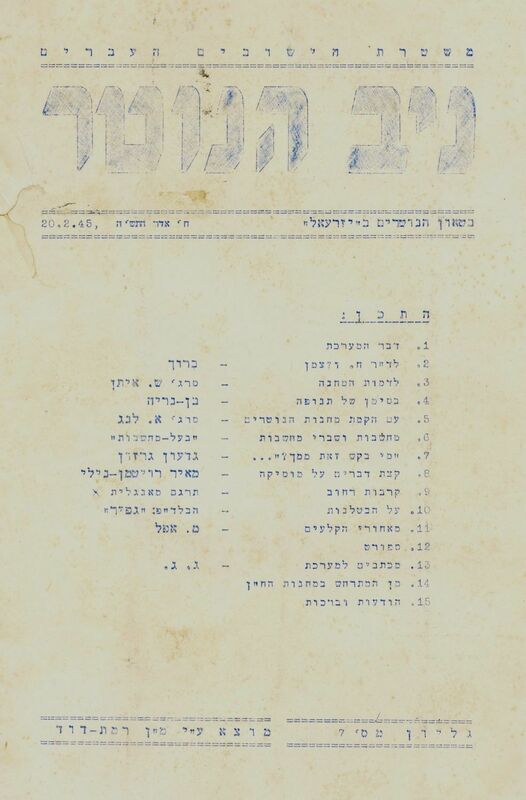 Niv HaNotar, bulletin of the guards in "Yizrael," published by the police in the Hebrew settlements, 20/2/1945, issue 7. Rare bulletin in stencil print with a few illustrations. This bulletin was published towards the end of the first year of the bulletin's publication. The first article is dedicated to Dr. Chaim Weizmann, it is followed by various articles on the topic of youth enlistment to the Notrim HaIvriim organization, the internal structure of the Notrim camps, ways to combat Arab terror, reference to the events of the Holocaust, a sport section, letters to the editor, events in other Notrim camps in the Land, and more. Rare, not found in the National Library. 14 pages. 33 cm. Stains. Moderate-fine condition.